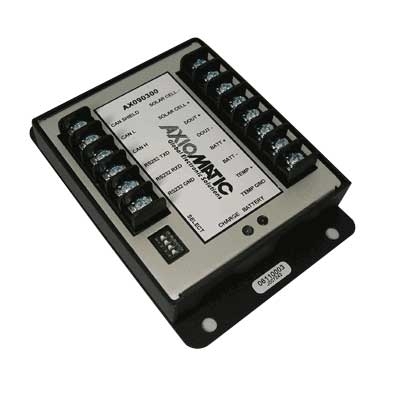 Axiomatic designs and manufacturers controllers in Ontario, Canada for solar power applications worldwide. Our BLDC Motor Controller turns on and off the solar tracker’s actuator motor and the inclinometer measures the angle for monitoring/testing purposes. An Axiomatic Solar Charge/Pump Controller interfaced with a solar cell can charge a 12V battery during the daytime and drive a 12VDC pump or motor for various purposes. This is ideal for remote applications. Our products are designed for harsh and IP65 or IP67 rated environments. The inclinometer, P/N AX060202, is designed to accurately measure inclination angles in two directions X and Y in the range of ±80º. It is functional up to ±90º. The resolved angles can then be output as voltages (three 0-5VDC signals). Due to a powerful microcontroller, the inclinometer can perform pre-processing of the angular information according to the users’ needs. Packaging is designed for IP67 rated applications such found in solar power and construction equipment installations. A solar charger/pump timer application is nicely accommodated with this hardware package and application-specific software. It features versatile control of a motor or pump and can charge a 12V battery from a solar cell.